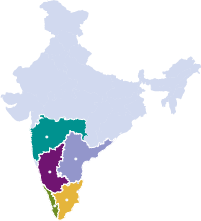 Starting with its first office in Kochi, the firm today has 27 partners located across 9 offices spread over the States of Kerala, Tamil Nadu, Karnataka, Telangana and, Maharashtra. The firm engages over 450 personnel across these offices. The various offices of the firm are closely linked to provide partner led services, with the motto of "Excellence and beyond". The firm is empanelled with the Comptroller and Auditor General of India (CAG), the Reserve Bank of India (RBI), World Bank, Securities and Exchange Board of India (SEBI), Audit Bureau of Circulations (ABC) etc.